Running and fat loss have been connected forever on the Florida beaches. 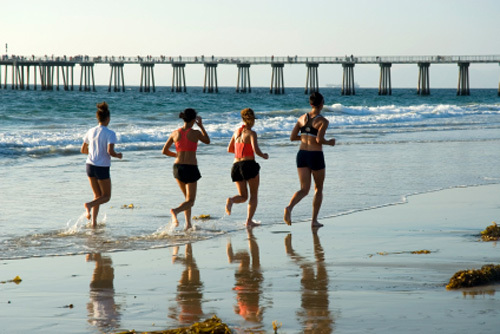 Beach running is outstanding to help burn belly fat and increase lean muscle. However, you must do it sensibly to get results. Lots of people are so enthralled with the beauty of the Florida Gulf Beaches, that when they come here to live, or on an extended vacation...they attack fat loss with intense beach running. Sadly, many become discouraged after just a few weeks because they either fail to see immediate results, or they experience an overuse injury from running on sand. I just want to cover a few simple strategies to help you get the best results possible, and to make beach running part of your normal, healthy lifestyle. * First, deal in reality: It took time to put on belly fat. It will take both TIME and EFFORT to lose it...but you can do it! * Your diet is much more of a factor for fat loss than running on the beach. Calories are always the key. It is much easier to refrain from ingesting 600 calories, than it is to run-off 600 calories. * Start making good food choices. Get sugar foods, junk fast foods, and processed foods OUT OF your diet. None of them help build a beach body. * Just because you run doesn't mean you can eat whatever you want. Making good food choices and maintaining a slight daily calorie-deficit will result in burning belly fat continually. * Ease into beach running. It will definitely put more stress on both your calves and the small muscles of your feet. If you have been running, just do half the distance you normally run your first two weeks. * Anticipate continual uneven surfaces and lack of traction. They will make you work much harder in less time, and when covering less distance. * Although running on the Florida beaches is an excellent deterrent to belly fat, you will accelerate your fat loss even more when you combine running with creative beach workouts. * Progressively work to increase your strength and endurance so you can handle interval workouts. This is how Olympic and professional athletes train. 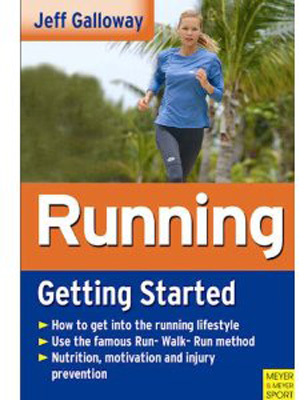 Jeff Galloway's Get Started Running is a primer for those wanting to start a solid running program for fat loss. Although not specifically geared to beach running, the techniques for good running and tips for motivation transfer nicely to the environment of the Florida beaches. * You will learn good nutritional and dietary strategies to fuel your workouts, as well as burn belly fat. * You will learn how to stay motivated when you feel like your results have plateaued. * You will learn how to stay away for over-training and injuries. * Jeff's book covers areas of interest for all levels of runners. Novice or competitor, you will each gain new insight. * Learn how to choose the best shoe for your specific foot fit and running goals. * Jeff Galloway's book, Get Started Running will help you with both your running and fat loss goals. I wish you the best of luck as you integrate yourself into the healthy lifestyle of the Florida beaches.